The sooty tern (Onychoprion fuscatus) is a seabird in the family Laridae. It is a bird of the tropical oceans, breeding on islands throughout the equatorial zone. The sooty tern was described by Linnaeus in 1766 as Sterna fuscata, bearing this name for many years until the genus Sterna was split up. It is now known as Onychoprion fuscatus. The genus name is from Ancient Greek onux, "claw", and prion, "nail". The specific fuscatus is Latin for "dark". Colloquially, it is known as the wideawake tern or just wideawake. This refers to the incessant calls produced by a colony of these birds, as does the Hawaiian name ʻewa ʻewa which roughly means "cacophony". In most of Polynesia its name is manutara or similar – literally "tern-bird", though it might be better rendered in English as "the tern" or "common tern". This refers to the fact that wherever Polynesian seafarers went on their long voyages, they usually would find these birds in astounding numbers. It is also known as kaveka in the Marquesas Islands, where dishes using its eggs are a delicacy. The sooty tern has little interspecific variation, but it can be divided into at least two allopatric subspecies. Some recent authors further subdivide the Indopacific population into up to 8 subspecies altogether, but much of the variation is really clinal. The affinities of eastern Pacific birds (including the famous manutara of Easter Island) are most strongly contested. This is a large tern, similar in size to the Sandwich tern (Thalasseus sandvicensis) at 33–36 cm (13–14 in) long with an 82–94 cm (32.5–37 in) wingspan. The wings and deeply forked tail are long, and it has dark black upperparts and white underparts. It has black legs and bill. The average life span is 32 years. Juvenile sooty terns are scaly grey above and below. The sooty tern is unlikely to be confused with any tern apart from the similarly dark-backed but smaller bridled tern (O. anaethetus). It is darker-backed than that species, and has a broader white forehead and no pale neck collar. Sooty terns breed in colonies on rocky or coral islands. 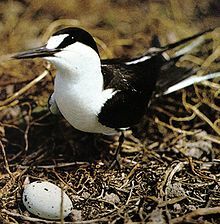 It nests in a ground scrape or hole and lays one to three eggs. It feeds by picking fish from the surface in marine environments, often in large flocks, and rarely comes to land except to breed, and can stay out to sea (either soaring or floating on the water) for 3 to 10 years. This bird is migratory and dispersive, wintering more widely through the tropical oceans. It has very marine habits compared to most terns; sooty terns are generally found inland only after severe storms. The Field Museum, for example, has a male specimen which was found exhausted on August 2, 1933 on the slopes of Mount Cameroon above Buea, about 1,000 m (3,300 ft) ASL, after foul weather had hit the Gulf of Guinea. This species is a rare vagrant to western Europe, although a bird was present at Cemlyn Bay, Wales for 11 days in July 2005. It is also not normally found on the Pacific coasts of the Americas due to its pelagic habits. At Baja California, where several nesting locations are offshore, it can be seen more frequently, whereas for example only two individuals have ever been recorded on the coast of El Salvador - one ring recovered in 1972, and a bird photographed on October 10, 2001 at Lake Olomega which was probably blown there by a storm . 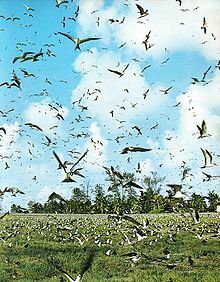 Hurricanes can also devastate small breeding colonies, as has been surmised for example for the sooty tern nesting sites on cays off the San Andrés Islands of Colombia. An exceptionally common bird, the sooty tern is not considered threatened by the IUCN. On Easter Island, this species and the spectacled tern (O. lunatus) are collectively known as manutara. The manutara played an important role in the tangata manu ("birdman") ritual: whichever hopu (champion) could retrieve the first manutara egg from Motu Nui islet would become that year's tangata manu; his clan would receive prime access to resources, especially seabird eggs. Bird in whom my eyes are gifted with unbounded vision . . .
^ a b BirdLife International (2017). "Onychoprion fuscatus". The IUCN Red List of Threatened Species. IUCN. 2017: e.T22694740A110635097. doi:10.2305/IUCN.UK.2017-1.RLTS.T22694740A110635097.en. Retrieved 15 January 2018. ^ Jobling, James A (2010). The Helm Dictionary of Scientific Bird Names. London: Christopher Helm. pp. 167, 282. ISBN 978-1-4081-2501-4. ^ Blond, Becca; Brash, Celeste; Rogers, Hilary (2006). Tahiti & French Polynesia. Ediz. Inglese. Lonely Planet. p. 217. ISBN 978-1-74059-998-6. ^ Or "Indian Ocean sooty tern" if more subspecies are accepted. ^ Fernández-Ordóñez, Juan Carlos (June 2003). "Sooty Tern (Crissal) Onychoprion fuscatus crissalis (Lawrence, 1872)". Avibase - the world bird database. ^ Fernández-Ordóñez, Juan Carlos (June 2003). "Sooty Tern (kermadeci) Onychoprion fuscatus kermadeci Mathews, 1916". Avibase - the world bird database. ^ "Sooty Tern Cemlyn Bay, Anglesey, Wales". michaelmckee.co.uk. ^ "Mexico - Central America" (PDF). The University of New Mexico. 2002. Tregear, Edward (1891): Maori-Polynesian Comparative Dictionary. Lyon and Blair, Wellington. Wikimedia Commons has media related to Onychoprion fuscatus.